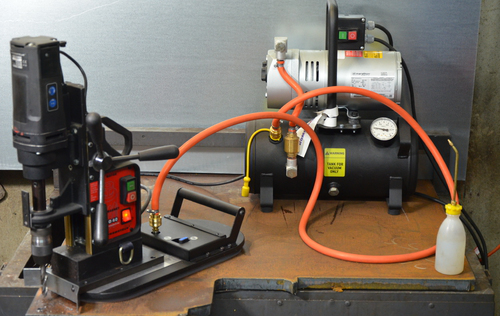 Promotech’s MCM machines are true portable CNC cutting and welding machines. 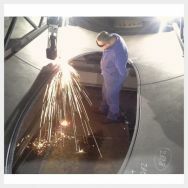 They can work on round, conical or flat surfaces as well as on multi-surface parts. These machines are designed and manufactured by Promotech and are made of highest quality European parts. The application of a door frame to a wind tower, which requires cutting, beveling, assembling and welding processes, is a time-consuming operation that deeply affects the manufacturing cycle. In all cases MCM machines produce perfect joints, door frame fit up and MCM SAW welds in “full penetration” class acceptability level B according to ISO 5817. Less than one percent of welding defect rate and no grinding by finished welded seam of the door frame inside and outside tower section it’s confirmed by customers in Wind Business. MCM SAW welding (outside) - less than one percent of welding defect rate and no grinding by finished welded seam of the door frame inside and outside. It’s confirmed with customers in Wind Business. PROMOTECH is an innovation driven ISO 9001:2000 manufacturer of professional power tools, welding automation equipment and industrial systems. We offer comprehensive range of mag drills and hydraulic punchers for hole making processes, pipe and plate bevellers to lay the foundation for high quality welds through accurate beveling with no heat affected zones or distortion of the work pieces as well as family of portable welding and cutting tractors to increase production and reduce welding costs. PROMOTECH provides also custom-made solutions incl. MIG/MAG & SAW welding, oxy-fuel and plasma cutting, pipe shape cutting, tailored for structural steel fabricators, heavy machinery manufacturers, shipyards and other metal machining companies.